YEAR0001 seeks a BUSINESS CONTROLLER to join our office in Stockholm. The Business Controller is our central economical foundation and is situation- and forward oriented, working with formulating goals and action plans. — Perform a wide range of financial analysis including managing the general ledger & month end close, balance sheet reconciliations, royalty statement processing, account payable processing, account receivable collection, payroll, financial statement review, cash flow forecasting and project budgeting & approval. — Review current processes and suggest and implement improvements to increase efficiency and enhance the control environment. — Responsible for updating and adding accounting policies for the business. — Evaluate financial reports and performance against budgets to determine how the company’s operations impact business finances and vice versa. — Drive the analysis and reporting for monthly Business Performance Reviews and other specific financially-driven projects. — Synthesise financial and non-financial information and trends to build budgets, short and long-term financial forecasts and provide input for strategic planning. — Significant experience in a similar or related role. — Degree level qualification in a Business, Finance or related subject (or equivalent industry experience). — Experience creating revenue forecasts and sales reports and presenting these to senior management. — Advanced knowledge of Excel and comfortable using complex excel formulas and building financial models. — Proficient with statistics, data valuation and business modeling. — Excellent business and systems analysis, critical thinking, commercial mindset and communication skills. YEAR0001 is a fast growing multidisciplinary music company with management, record label, publishing and creative studio based in Södermalm Stockholm. Representing a range of artists like Yung Lean, Gud, Yung Sherman (Sad Boys), Merely, Bladee, Ecco2k, Thaiboy Digital, Whitearmor (Drain Gang), V**gra Boys, Nadia Tehran, Dungen, Quiltland and more. Yung Lean. Wings of Desire. O2 Academy Brixton, 21st November 2018. A night of live music and art curated by Yung Lean, featuring very special guests and performers, pop-up shop and more. 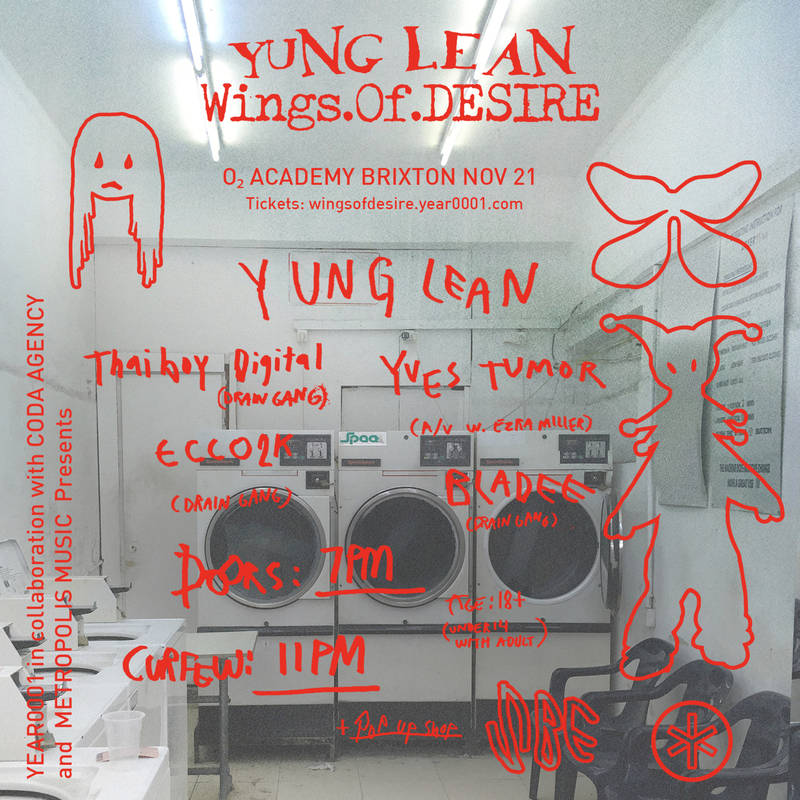 Headlined by Yung Lean himself, Wings of Desire will also feature performances by Yves Tumor AV with visuals by Ezra Miller, Bladee, ECCO2K, Thaiboy Digital, a pop-up shop with exclusive Wings of Desire merchandise + much more to experience and indulge on site. Wings of Desire art direction and concept by Victor Svedberg, press images by Gustav Stegfors and Gus Reichwald.